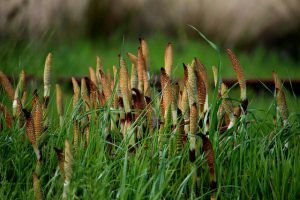 Horsetail is a close relative of trees that grew on the earth 270 million years ago and is a prehistoric botanical relic. It is recorded in the herbals of Gerard (1597), Lewis Linnaeus, Culpepper and Galen. It has been found in Chinese Literature since the Materia Medica of the Jia You Era (1016 AD) and is called mu zei. Its brittle jointed stems are rich in healing silica and since the times of the ancient Greeks has been used for wounds and any treatment requiring large amounts of silica. Soluble silicic compunds (up to 10%), flavonoids, saponins, organic acids, and traces of nicotine, palustrine and palustrinine.